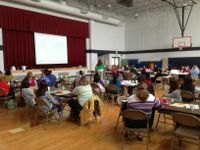 Since Knapp Elementary held its first "ParentCamp" on April 27, our learning community has been engaged in conversations far beyond those 27 discussion sessions led by local parents and teachers. The ParentCamp experience, by design, is a hybrid "unconference" opportunity for parents and teachers to come together and model the four core beliefs highlighted in Beyond the Bakesale by Anne T. Henderson, et al. The experience levels the playing field, putting all stakeholders in a circle for actual, face-to-face discussion about what is best for kids. It's important to understand the difference between a traditional conference and the unconference feel we worked to bring to ParentCamp. A speaker stands and delivers a presentation. The audience participation is minimal. The typical room setup is a presentation screen with the audience seated in rows facing the speaker. The discussion leader sits among the group members to lead the discussion. The expertise and experience "of the room" is harnessed from the start of the session. Face-to-face perspective sharing leads to relationship-building, networking and a sense of "we’re all in this together." After participating in EdCamp Philly and EdCamp Leadership last year, it's hard not to be inspired to find new ways of infusing these participant-driven professional development approaches into our own learning communities. 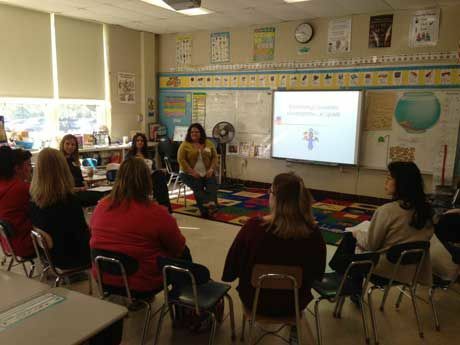 We began by hosting an EdCamp-style, building-based professional development at Knapp Elementary in September and January. After the September offering, we left the "big board" of sessions up for the Home & School Meeting happening later that evening. As we shared the unique format and listed the discussions in which teachers were involved during their In-Service Day, parents imagined what they might experience discussing and learning with teachers in the same atmosphere. With interest from our home-school team, we started the planning process to secure a manageable schedule, discussion leaders, registration, sponsors, and district and technology support. Several parents and teachers began meeting each month, both physically and virtually (using Google Docs), to organize and share the information detailed below. Five to ten local and national sponsors were sought to cover the possible expenses of continental breakfast, lunch, technology access (a one-day wifi pass) and any other costs. Social media was a big help in securing the financial support necessary to stage our unconference. Potential sponsors were asked to complete this gForm. 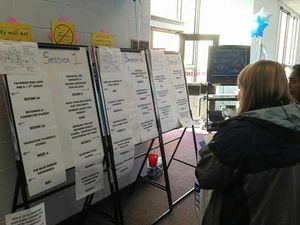 A one-day guest wifi called "ParentCamp" was set up, allowing guests to log in from their own personal devices for Internet sharing during the conference, Skyped sessions, etc. Through the Twitter hashtag #ParentCamp, this information-sharing opportunity was used frequently by discussion leaders and attendees throughout the unconference. Our technology assistant was also on hand in case we needed emergency tech support. Check out the day’s #ParentCamp feed on this Storify page. We had two custodians on duty for unconference setup, unanticipated needs and breakdown afterward. Discussion leaders had the opportunity to submit session ideas in advance using this gForm. Typically, an unconference begins with a blank palette of sessions, but since the majority of participants and discussion leaders were new to the experience, we kept this traditional piece in place. Attendee signups were available online using either Eventbrite or an embedded form on our Family Engagement Wiki. We also sent the form to our families via email and shared out on Twitter for local learning communities that might be interested. For families without technology access, we provided a hard-copy flyer in mailboxes and on the front office counter. Parents and teachers went door to door in our car rider line to spread the word face to face. All elementary families from our district were encouraged to send at least one parent, grandparent or other guardian to this conference. A week prior to the event, once all sessions were confirmed, we shared this online conference session sign-up using Eventzilla. Your school or district is invited to participate in planning and implementing the next ParentCamp on Saturday, November 2, 2013 at Knapp Elementary School. @KnappElementary is looking for other schools around the world to share in the parent-teacher learning this fall. 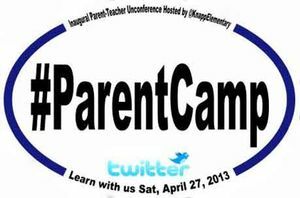 We'll offer global sessions, a Smackdown and a #ParentCamp hashtag to amplify the potential of the day. Complete this brief gForm if you'd be interested in serving as an unconference site for ParentCamp. For more information on ParentCamp, contact Joe Mazza or Gwen Pescatore. You can also follow @ParentCamp on Twitter.